The projection of a roman blind will depend on how and where it is fitted. Because a roman blind folds up and creates a nest of folds, the folds need somewhere to go. If the roman blind is installed against a wall, the roman blind will project forward when it is pulled up to accommodate the nesting of folds. Depending on the height of the blind and the number of folds, the projection can be anywhere between 100 mm and 200mm. If the roman blind is installed within a window reveal, the folds can hang below the blind and nest back inside the reveal. Light gaps are caused because the window blind cannot sit tightly within a window. None of the blinds that we offer on-line with provide you with a 100% light block. If you are after a 100% light block solution we can offer this however, we will need to call us as the product is a little too complex for on-line sales. The fabric of a roman blind runs to the full width of the blind. So if you order a blind that is 1200mm wide the fabric will be 1200mm wide. 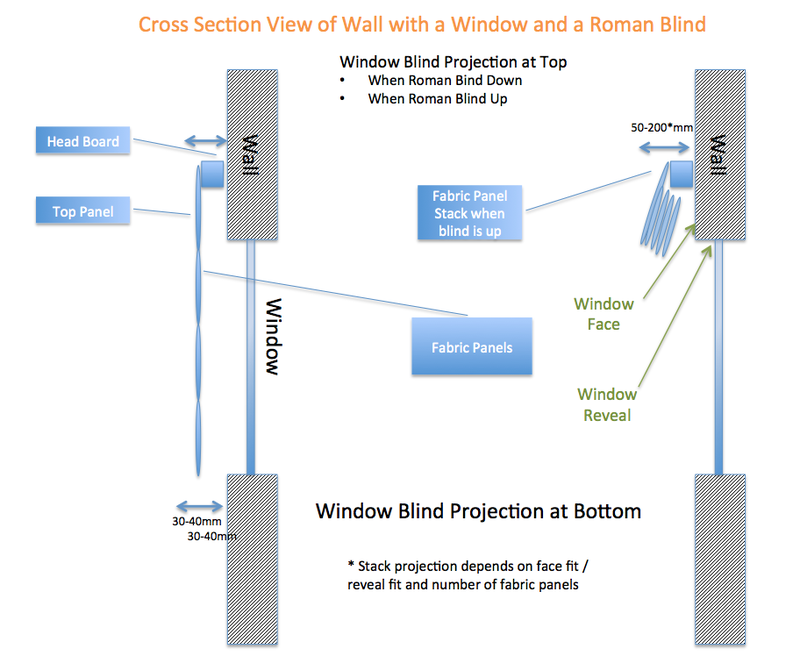 If a roman blind is set on the wall above a window for a face fit type setting, the gap will be just the projection gap. If the blind is made approximately 100mm wider than the window then the ability of light shine directly into the room is reduced considerably. Recently we have change our operation of roman blinds so we now use a continuous chain system that is very similar to the roller blind. Like the roller blind, the bigger the blind, the harder it is to lift.